As everybody knows that the characters in image PDF document cannot be copied, changed or modified. If you want to make the characters as the editable ones, you should convert image PDF to Text document, which allows you to use the characters freely after the conversion. Image PDF to Text Converter based on OCR technology is a tool specially designed for converting image PDF to Text document. It is free to download and evaluate. Image PDF to Text Converter is MS-DOS interface oriented and natively supports being called from a script. If you want to run this application on a server, please buy a server registration key. This application also supports being redistributed within a third-part software package under grant of a developer license. Please unpack the downloaded package, and you can instantly run the application via a command prompt window without any installation steps. Before the conversion from image PDF to Text, please open MS-DOS command prompt window by clicking "Start"—"Run" and inputting "cmd" in popup dialog box, then click "OK" button. Or you can press and hold "Window" and press "R" in your keyboard to fulfill the same work. In cmd dialog box, you can input the command line according to the following basic one. In Figure1, there is a command line example for converting image PDF to Text document following the basic one. 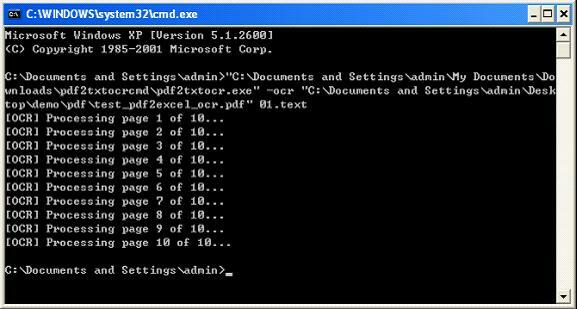 "C:\Documents and Settings\admin\My Documents\Downloads\pdf2txtocrcmd\pdf2txtocr.exe" stands for the directory of the executable file in the application—pdf2txtocr. It can be called just by being dragged into the prompt window. "–ocr" is the OCR technology the application will take. "C:\Documents and Settings\admin\Desktop\demo\pdf\test_pdf2excel_ocr.pdf" is the path of original PDF document, which can also be dragged into the dialog box. "01.text" stands for the file name and extension name of new Text document.